How World War One split communities in south Wales is the subject of documentaries to be premiered in Blaenau Gwent on Wednesday. They tell the stories of some of the 900 Welsh conscientious objectors, including 25 who hid in the Brecon Beacons and seven who died in jail. 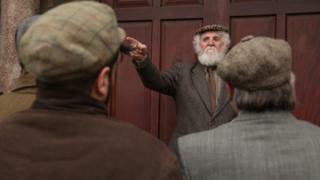 The films being shown at Tredegar's Little Theatre also detail the life of Wales' first Labour MP, Keir Hardie. Fifteen unemployed people researched, filmed, edited and acted in them. They found how NHS founder Aneurin Bevan was excused service because of an eye condition and two brothers were put in jail after swearing to their father on his death bed they would not fight. The films follow Hardie's journey from Scotland to Wales, where he campaigned against conflict when war broke out in 1914. Details are given about how he was labelled "the German" by some in south Wales because of his opposition. Falklands veteran Simon Weston said that despite joining the Army, the thought of using a rifle "fills me with horror" and nobody should have been judged. But the documentaries look at how people living in the south Wales valleys were divided because of their religion, social standing and political views. The Made in Tredegar film company was behind the project, with a £9,700 Heritage Lottery Fund grant helping it offer work experience to unemployed people with an interest in media. It has made about 50 documentaries, mainly on local characters, including milkman Trevor Jones, who said he was too busy with his round to visit the palace to receive an MBE. An officer was then sent to present it to him in the town. Alan Terrell, of Made in Tredegar, said it was "the right time" to document the area's involvement in World War One as it is 100 years since many local men were conscripted. It took about six months to carry out research at the Gwent Archives, Ebbw Vale and Cyfarthfa Castle museum in Merthyr Tydfil, with re-enactments of Hardie's life filmed around south Wales. Mr Terrell said: "The war split many south Wales communities 50-50 with religion, political beliefs, class and allegiance to the king all playing a part." While many south Wales miners fought conscription because of their role providing coal, they were called up in the last year of the war. The research found an item in the Merthyr Pioneer from 1918, where a 20-year-old collier called Aneurin Bevan successfully argued against being drafted because he suffered from nystagmus - an involuntary movement of the eyes. After Wednesday's premiere of two 15-minute films on Hardie's life and World War One, copies will be given to schools in Blaenau Gwent.